The Golden State Warriors look awesome. Steve Kerr has the Dubs firing on all cylinders at both ends of the court. They are shooting the lights out, as per usual; an elite shooting club in all three ranges on the floor, they rank first in close-range shooting efficiency, fourth in midrange efficiency, and fifth in long-range efficiency. The Warriors also have the highest true shooting percentage in the NBA. Their shot-making brilliance starts with “The Splash Brothers.” Both currently top-five scorers, Stephen Curry and Klay Thompson combine to average 53 points per game. Their backcourt, it’s safe to say, is in pretty good shape. 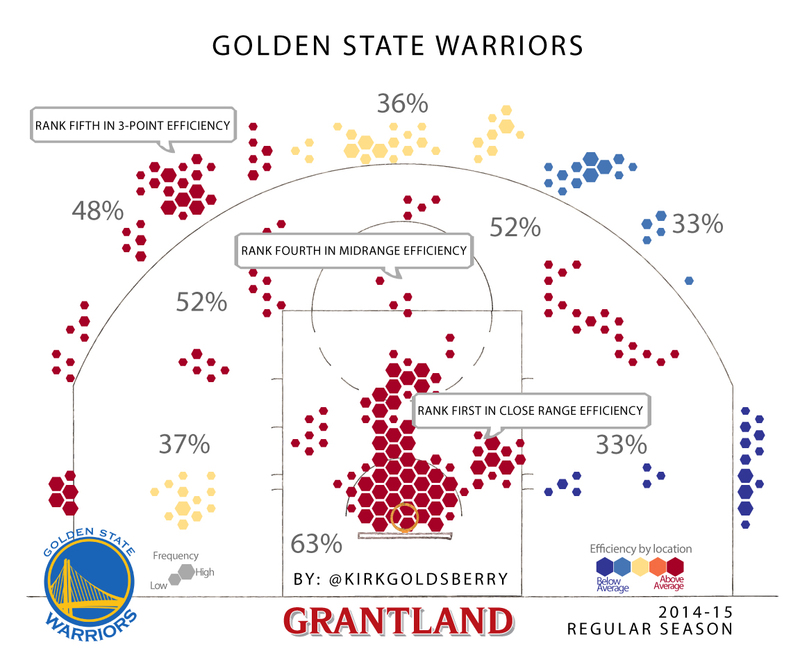 If the first week is any indication, though, the Warriors are more than just a pair of pretty jump-shooting guards. For the last few seasons, Golden State has struggled to blend all of the team’s talent together and fully realize its massive potential. To be fair, they’ve had injuries — especially Andrew Bogut injuries — but even then, their playoff exits always seemed to leave us wanting more. Through a few games, they’ve done exactly that, making some gorgeous basketball in the process. This season, the Warriors guards are cutting more often and more intelligently than they have in the past, especially when the bigs have the ball. In this play, Bogut hands the ball off to Klay and then uses his giant frame to get Thompson a good look from the baseline. In this instance from the preseason, the same Bogut-handoff action bests a couple of world champions, and Thompson drops in an easy layup. In this last example, it looks like they’re about to run the same handoff action for Curry, but instead of looping around for the handoff, he darts straight through the paint, and David Lee delivers him a picturesque bounce pass. The Warriors’ guards were already a huge pain to defend, but if Kerr can design schemes that regularly get them quality looks like these, well, it’s not hard: Stephen Curry plus Klay Thompson plus open shots equals a fantastic offense. You need more than an unstoppable offense to win a championship, though, and right now the Warriors defense looks awesome. Like, best-defense-in-the-league awesome. They rank first in defensive efficiency, giving up a paltry 91 points per 100 possessions. Through five games, Warriors opponents are attempting only 35 percent of their shots inside of 8 feet (second-least in the NBA) and 42 percent of their shots in the midrange (the second most). In other words, Warriors opponents are taking the “worst shots” on the floor on a regular basis. And it all goes back to Bogut, one of the keys to their success on both ends. His screens, handoffs, and passing allow Kerr to add new cool wrinkles on the offense, while his intimidating size and defensive prowess keep opponents at bay on the other side. If it’s true that offense wins games and defense wins championships, then it might not really matter how good of a coach Kerr is. It might only matter whether Andrew Bogut is healthy enough to be on the court. Even though you can’t tell much after five games, Bogut has played in all of them. Kerr and the Warriors could not have asked for a better start.